Product information "Thromboxane B2 ELISA Kit"
Thromboxane A2 (TXA2) is produced from arachidonic acid by many cells and causes irreversible platelet aggregation and contraction of vascular and bronchial smooth muscle. Like most lipid mediators, TXA2 is not a circulating hormone. It is formed in response to local stimuli and exerts its effects within a short distance of its biosynthesis. TXA2 is rapidly hydrolyzed non-enzymatically to form TXB2, which is then quickly metabolized (t½ = 5-7 minutes) to urinary metabolites for clearance by the kidneys. Because of the transient nature of this compound it is difficult to accurately measure circulating levels in whole animal experimental models. In fact, it has been shown that plasma and urine levels of TXB2 are primarily due to ex vivo platelet activation and intra-renal production, respectively. Therefore, measurement of TXB2 metabolites, such as 11-dehydro TXB2 (Cay-519510), in urine and plasma may give more accurate estimates of in vivo TXA2 production. TXB2 measurement is better suited for samples that are unlikely to undergo extensive metabolism such as perfusates, lavage samples, tissue/cell culture, etc. 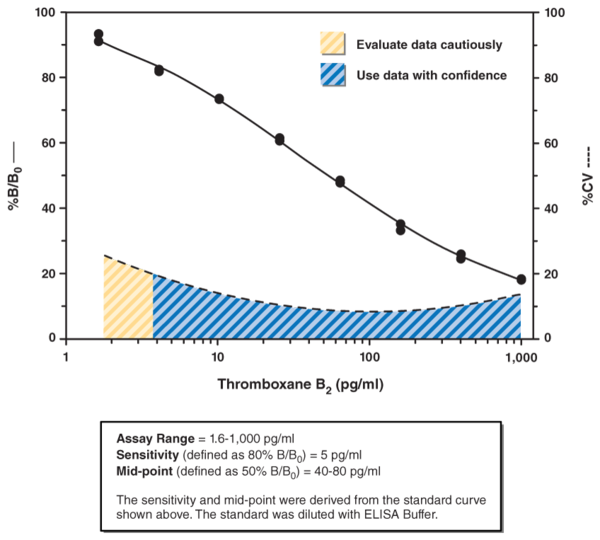 Customer review for "Thromboxane B2 ELISA Kit"